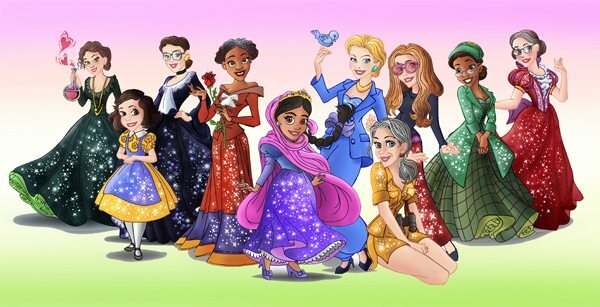 David Trumble, artist, ‘flattened’ real life, female role models to Disney-fy them as princesses. The outcome is both fascinating and, in some circles, controversial. I think it is a brilliant way to drew focus to the nonsense of the unrealistic Disneyesque heroine still being fed to our young women, and men, as a/the stereotypical female. None of the real women drawn by Trumble are alike, until he ‘flattens’ them, totally removing their genuine strength and dehumanising them into cartoon caricatures, almost unrecognisable as real people. True art stirs opinion, thought, dialogue (hopefully). Trumble’s work here does and should. Check out the link to see what you think.